Here is something from my seemingly endless preparation of The Quiet Revolution. It’s a story that I often related to audiences to illustrate the changing nature of the information that we are using today and our need to redefine literacy. There was a study conducted by the University of California at Berkley called “How Much Information.” They discovered that the world generated five exabytes of information in 2002. To clarify, if we added five exabytes of information to the Library of Congress, the largest library in the world, it would require the building of 37,000 more Libraries of Congress to hold that year’s additional information. The kicker, however, is that only one one-hundredths of one percent (00.01%) of that information ever got printed. 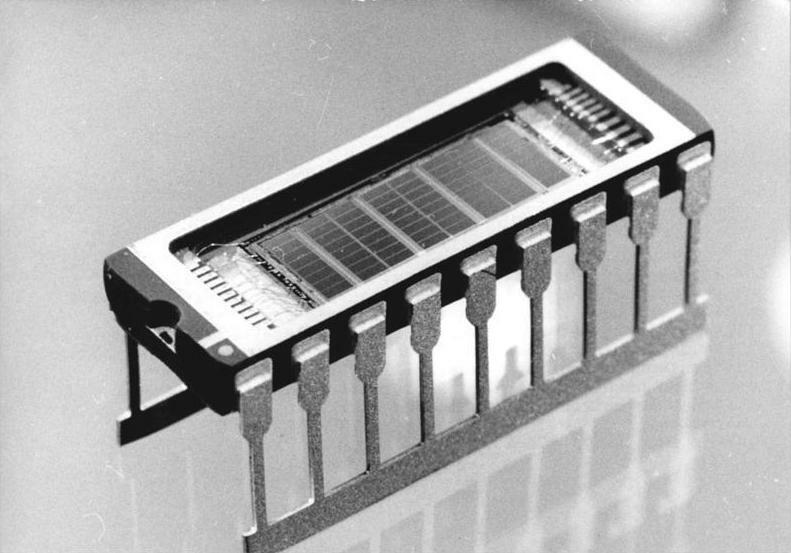 All the rest of the new information was digital, existing as 1s and 0s and residing on the memory cells of magnetic tape, disks, optical discs and integrated circuits; and requiring digital technology and technology skills to access and use that information. If more and more of our information is digital and networked, then we can take the paper out of our future workplace. Author David WarlickPosted on April 14, 2018 Categories education, information, learning, learning-literacy, literacy, shakabukuTags digital, education, information, literacy, new literacyLeave a comment on How Much Information? Even though I suspect that most Americans, Republican and Democrat, believe in mostly the same things. 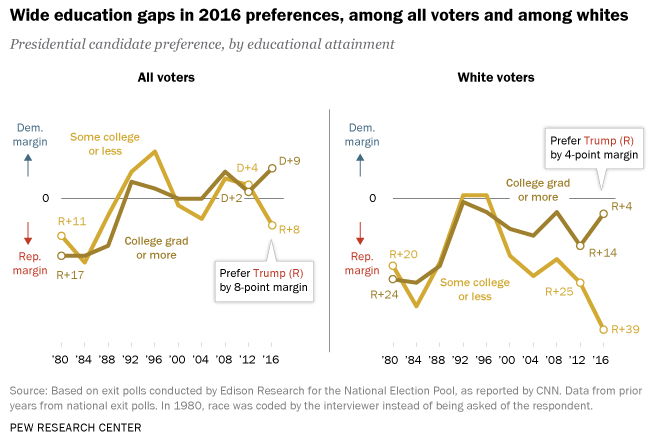 The political gap seems to have much to do with your neighborhood – that is to say, how far you live from your neighbors. I did a little figuring with the population density of each state and the percent of votes cast by its residents for Donald Trump. The correlation coefficient (yes, I’m college educated) was -.46, which apparently is a moderate downhill or negative relationship (see chart #1). 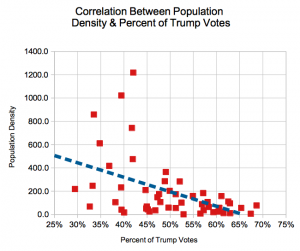 In other words, the higher the population density (urban) the less likely you and your neighbors were to vote for Trump. 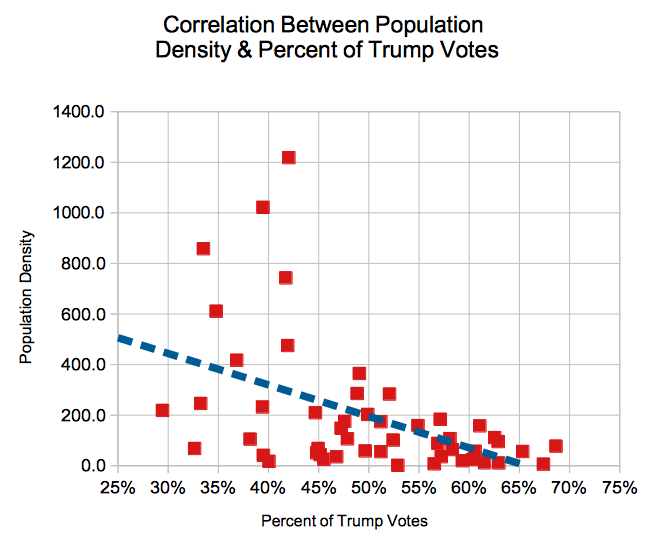 The lower the density (rural), the more likelihood of Trump votes in your neighborhood. But this gap seems to have been magnified by the U.S. Constitution, as the document describes the Electoral College. North Dakota, 47th in density ranking, cast 216,133 votes for Trump. That amounted to only 72,044 votes for each of the state’s 3 electoral votes for the Republican candidate. 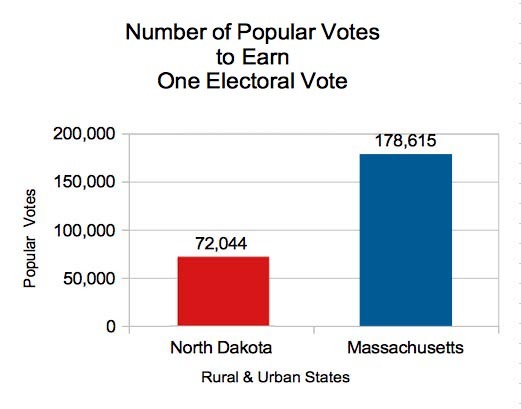 In Massachusetts, the 3rd most densely populated state, it took over 100,000 more votes for Clinton (178,615) to earn one of the state’s 7 electoral votes for the Democrat (see chart #2). There are many ways to read meaning into this, and I’m going to be thinking pretty hard about it. But we might assume that free college education, as provided in many European countries, is pretty much off the table here at home. My point is this. What we typically think of as literacy and what’s taught in schools, needs to expand. In the age of Internet, social media and 24 hour news, literacy is no long just the ability to read and comprehend. It is equally critical that the literate be skilled and inclination to detect if what they are reading is intended to inform their behavior, or manipulate it. 2 Pugliese, Anita; Ray, Julie (11 Dec 2009). 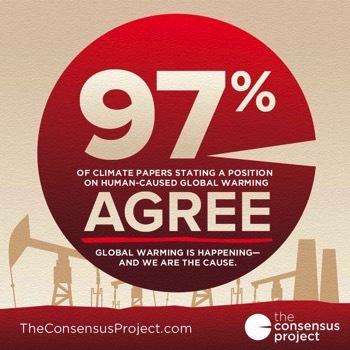 “Awareness of Climate Change and Threat Vary by Region”. Gallup. Retrieved 22 Dec 2009. Many would disagree, but I believe that the introduction of new information and communication technologies into our classrooms has had a productively disruptive effect on education. We have certainly not seen its full potential, and reaching it may well be impossible for a human society. But I’ve recently wondered about a new disruptive influencer on the horizon, one that has the potential to further progress formal education – or destroying it – in my humble opinion. Consider that even though some presidential candidates have promised to bring back the manufacturing jobs that America has lost to China, the jobs that actually left our shores are a mere ripple, as Matthew Yglesias put it in a recent MoneyBox article,1 compared to the manufacturing jobs we lost to robots during the same years – and those jobs will not return. And now we have driverless cars, just around the corner? 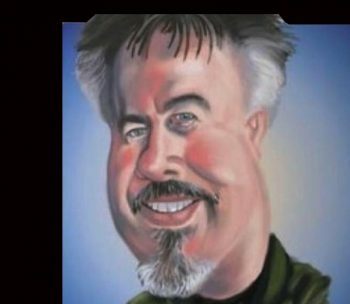 Sam Tracy, in a 2015 Huffington Post article itemized the numbers of Americans who make their living by driving: taxi drivers, chauffeurs, bus drivers, driver-sales workers, school bus drivers, postal service carriers, light truck deliveries and heavy truck transport. It totaled almost four million jobs, with wages of almost $150 billion a year. Will there really be new jobs for them to train for? All this is to suggest that the job of schools, sooner than later, may be to educate our children to be unemployed. Consider the recent media interest in the concept of basic income. Here is a Google Trend graph of the frequency of the term’s searches. In the most general terms, basic income would have the federal government handing out to all citizens enough money to live on. Those who want more would work for a wage. Those who do not, would find some other way of spending their time. Experiments are already underway in Brazil, Canada, Denmark, Finland, Germany, Iceland, Ireland, Luxembourg, Netherlands, Norway, Portugal, Spain, Sweden, Switzerland & the UK. Coincidentally, this article, Machines Won’t Replace Us, They’ll Just Force Us to Evolve, popped up in my Reddit stream just minutes after submitting this blog post. The title of this article is a question, because I admit my ignorance of the answer. I’ve not been paying much attention to THE conversation, since I have finally accepted my status as retired. Wahoo! But I am working on another book, so my mind is still in our righteous endeavor, even though my PLN has evolved. The book I am working on will be a history of technology in education, as I have witnessed it – so programming is on my mind. You see, that’s what we called it back in the 1982, programming. So I was struck by a sense of déjà vu when I saw so much of the edtech discussion, at the recent Raleigh NCTIES conference, devoted to coding. But are we (and I’m asking this question seriously) missing the point of a skill that has been so important to me, not to mention a pure personal joy? You see, what has made coding so important is not necessarily its practicality, though I have been able to support the educational endeavors of many teachers with my tools. It’s not even the bread it has put on my table, though I am enormously appreciative of that. 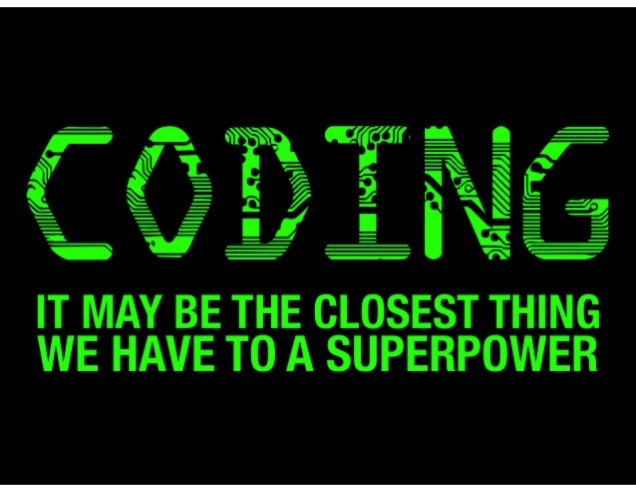 I often tell the story that on that first afternoon, after spending my first couple of hours teaching myself how to program (uh, code), I got on my hands and knees and I thanked every algebra teacher I had ever had. There was finally a practical use for those mystical techniques for manipulating numbers. But there was a major difference between how I was using Math and how I was taught Math – and it is a difference that strikes right at the heart of what we’re doing wrong in education. You see, I immediately understood, though I may not have been able to express it, that I was using Algebra as a language, in order to instruct the digital environment (Radio Shack TRS-80 computer) to behave in the way that I wanted. If you can communicate with a computer, then you can use it to learn and express. 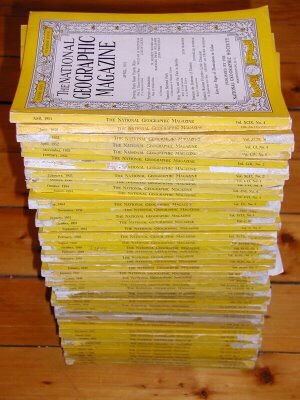 We learned Reading so that we could read our textbooks and other more authentic sources of knowledge. We learned to Write so that we could articulate our growing knowledge. Maybe we should learn Coding in order to learn the language of numbers, so that we can learn from our own thoughts and express our ideas in endlessly creative ways. ..instead of teaching Math and teaching Coding. Of course, I’m not the first to suggest such a radical idea. It was during those earliest years that some very smart people (Seymour Papert & my friend, Gary Stager for two) were already suggesting and putting into action this very idea with the Logo programming language. 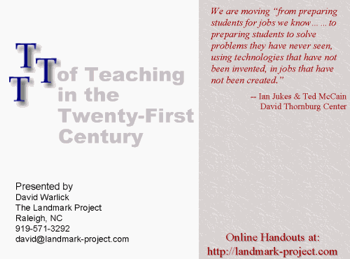 Author David WarlickPosted on March 16, 2016 March 16, 2016 Categories conferences, education, information, literacy, Mathematics, shakabuku, STEMTags coding, computers, education, learning, ncties, ncties16, programming, teaching, technology, TheWayItsSupposedToBe2 Comments on Are We Missing the Point? In my efforts to write this book about the history of educational technology (as I have witnessed it), I’m finding myself doing more reading than writing. I guess that’s normal for book-writing, though it surprises me since I am typing this mostly from my own recollections. This morning, in my reading, I learned a new word. It’s mesofacts. These are facts that, when learned, seem to be dependable, longterm and applicable truths – when in fact, they are likely to change within a lifetime, and often within a few years. In his Harvard Business Review article, Be Forwarned: Your Knowledge is Decaying Samuel Arbesman relates an example, a hedge fund manager saying in a conversation, “Since we all know that there are 4 billion people on the planet…” 4 billion people is what I learned when I was in school, and it still surprises me when I heard that it was up to 6 billion and now 7 billion. Arbesman says that these mesofacts are far more common than we realize. It makes me wonder about how much of what we are expecting our students to memorize, will simply not be true in their adulthood, and may even be problematic. This all supports something that I heard someone say a few years ago. should not be on any test. we rob them of their tomorrow. Another word I learned is scientometrics. 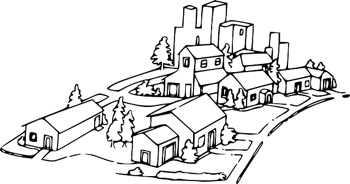 Its the study of the shape of how knowledge grows and spreads through a population. I’ve been doing a lot of deep digging while working on my book about the history of technology in education – as I’ve seen it. This afternoon, I happened upon some online handouts for one of my first keynotes and its slidedeck. The address was called, “The Three Ts of Teaching in the Twenty-First Century.” It appears to have been delivered in November of 2000. On one of the opening slides, I had listed the ten most searched for terms of that month. As a comparison, I found the top ten searches on Google in 2014, and have listed them as well. I was actually surprised how little it’s changed? We have video games, sports, entertainment with a peppering of world-shaping issues.